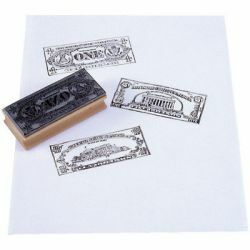 Catalog Home > "$1,$5,$10 BILLS KIT TAILS"
Create your own money activities and games using this 3-piece set of super-authentic rubber stamps. Makes crisp, clear images of $1, $5, $10 bills. The wooden handles are clearly marked with dollar values. Each measures approximately 1 3/4" x 3 3/4"